Back in Aug. 2012 we noted the new Toledo Lounge had closed for renovations. The original Toledo Lounge was sold back in Feb. 2011 to the owners of the Black Squirrel and Ventnor Cafe. Libertine has finally arrived featuring “one of the country’s largest absinthe selections”. 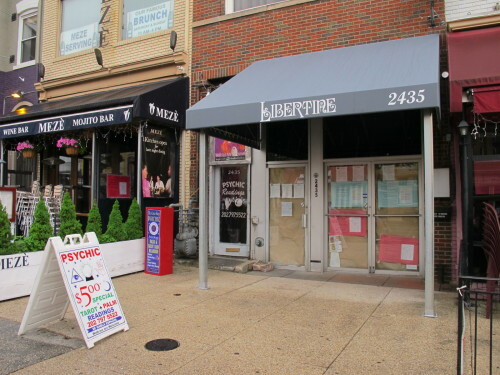 “Libertine, a cocktail house and bistro, located at 2435 18th Street NW in Adams Morgan, will hold its grand opening on Tuesday (July 9), starting at 5 p.m.
Libertine features one of the country’s largest absinthe selection with 30 different labels, many that were specially ordered from Europe, 10 specialty cocktails and four cocktail draft lines, a potpourri of small-batch spirits and locally produced wines, and craft beer draft lines. Flights of draft cocktail are available. The name Libertine is a nod to the absinthe and spirits program as well as free-thinkers and those who live an unrestrained life. 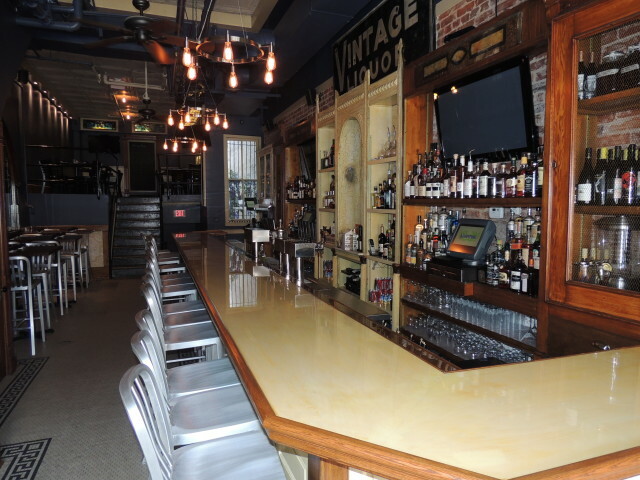 The signature ambiance of the restaurant and bar, headed by executive chef Brent M. Sick and general manager Morgan Tramontana, comes from the reclaimed architectural remnants and marble dating to the 1800s. These artifacts, which were secured in Pennsylvania and North Carolina, ended up serving as the grand back-bar and wainscoting that trim in the space. Mr. Sick, the recently appointed executive chef of both Libertine and the Black Squirrel Restaurant and Bar, has fashioned a menu stuffed with mussels, oysters, crab and po’ boys, with a dash of down-home creole seasoning. The seafood-centric food menu is inspired by the neighborhood bistros that dot urban centers. “I think it’s a fun yet bold menu, distinctive yet inviting to all kinds of palates,” Mr. Sick says. A native of Williamsport, Pa., the 33-year-old Mr. Sick has mastered a broad range of cuisines, while employing a number of the arts gleaned from celebrity chef Wolfgang Puck, whom he labored under in Orlando, Fla.
Ms. Tramontana, a 28-year-old native of Lafayette, La., has had a hand in developing all the specialty cocktails, including the four draft cocktails. A favorite of hers: To Cherie: With Love, Jack. She says it was no easy task designing the recipes and credits the creativeness of former PS 7’s pastry chef Lauren Whitledge in providing insight to the process. Metro bus with “Call 911” message – How to Find out What Happened?